SAN SALVADOR, Oct 16 2013 (IPS) - Some 50,000 files on crimes against humanity are languishing in an undisclosed location in El Salvador, prey to damp and the ravages of time, while activists and lawyers frantically try to regain control over them. Without prior warning, on Sept. 30 the Catholic Church suddenly closed the office that had spent decades painstakingly collecting the documents: the Tutela Legal del Arzobispado – the legal aid office of the archbishop of San Salvador. But the former employees of the office, who learned that day that it was being closed, are working to reopen it elsewhere and are laying claim to the files. “We are the legal representatives of the victims of abuses and their families, we are handling the cases, and that means our work has to continue,” Alejandro Díaz, a lawyer who was laid off when Tutela Legal was closed, told IPS. “We are taking the last steps to relaunch the new office,” which will be called Tutela Legal Doctora María Julia Hernández, in honour of the human rights advocate who was the director of Tutela Legal from 1983 till her death in 2007, Díaz said. The files contain the accounts given by survivors and victims’ families on audiotapes, videotapes and written documents, photos of victims and relatives, and documentation of places and dates of massacres and other crimes committed during the 1980-1992 civil war. Tutela Legal spent decades collecting documentary evidence and testimony about the abuses, while providing legal aid to survivors and victims’ families. Funding for the new office will come from the same international organisations that supported Tutela Legal, including the Catholic aid agency for England and Wales (CAFOD), the French Catholic Committee against Hunger and for Development (CCFD), and the Caritas branch in the northern Spanish region of Asturias. “These organisations have promised us the same support they gave us when we were in the archbishop’s office,” Ovidio Mauricio González, the director of Tutela Legal at the time of its closure, told IPS. Some 300,000 dollars are needed to digitise all of the material and organise it in accordance with international standards, González explained. A portion of the documents on paper are in poor condition due to damp and the passage of time, he added. The archbishop of San Salvador, José Escobar, alleged a few days after the Tutela Legal office was closed that the decision was due to misuse of funds. But he did not provide any details. According to González, no doubts were ever raised about the management of funds by Tutela Legal, which underwent regular audits by the international organisations that financed it. 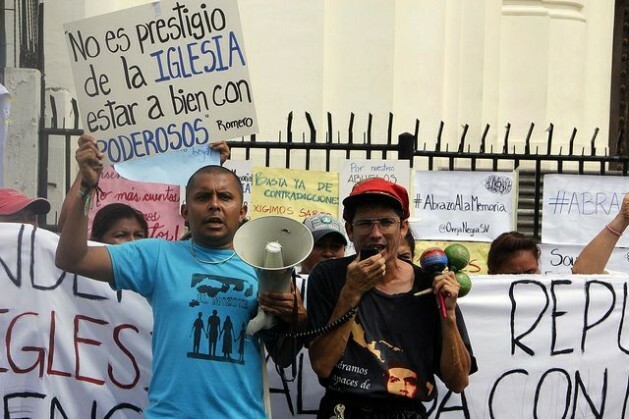 Activists point out that 10 days before the office was closed down, the Supreme Court did something that was surprising given the history of the justice system in El Salvador: it agreed to hear arguments challenging the constitutionality of the 1993 amnesty law, which has let the perpetrators of human rights crimes committed during the armed conflict off the hook. The Tutela Legal archives could serve as key evidence in legal prosecutions that may be reopened, depending on the Supreme Court’s decision. Human rights groups at home and abroad are worried about where the files may be. A group of around 100 national and international organisations also published lengthy advertisements in the local press, calling for the preservation of the files. The archbishop’s office claims it is protecting the archives, although it transferred them to other installations, which have not been disclosed. “I’m here in solidarity with these people in their just demand to preserve the archives,” Andrea Mcleoud, an activist with Somos Tutal (We Are Our Land, in the Nahuatl indigenous tongue), told IPS during an Oct. 6 protest outside San Salvador’s Metropolitan Cathedral. Somos Tutal is a group of student activists from the José Simeón Cañas Central American University (UCA). Tutela Legal was set up in 1982 by then archbishop Arturo Rivera y Damas after he closed its predecessor, Socorro Jurídico, which was founded in 1977 by archbishop Óscar Arnulfo Romero. Romero was assassinated by far-right death squads while saying mass in March 1980, when the armed conflict broke out in this impoverished Central American country of six million people. Some 80,000 people –mainly civilians – were killed in the conflict in which government forces and right-wing paramilitary groups were lined up against the leftist Farabundo Marti National Liberation Front (FMLN) – now the governing party. “We are not demanding anything that is not ours, but something that belongs to us, the families of the victims,” said Rosa Rivera, whose family was killed by soldiers and paramilitaries on May 14, 1980 along with 300 other peasants, including women and children, who were trying to flee to Honduras across the Sumpul river in the department or province of Chalatenango. But the files also contain cases involving more recent human rights abuses. One example is the case against lead contamination in a rural community caused by a car battery factory. The case was referred to the Inter-American Human Rights Commission in 2008. Far from here, in the Vatican, the beatification of Monsignor Romero is moving forward quickly, on the decision of Pope Francis. But paradoxically, part of his legacy is hanging by a thread. What does the archbishop want to hide….